Satellite galaxies are assumed to be widely distributed around their host and move in random directions. But that’s not what astronomers found when they observed Centaurus A. Dwarf galaxies aren’t behaving the way that astronomers have predicted, and a new study describes a third example of their unexpected behavior. The authors say these repeated findings call into question current theories about dark matter. According to standard model of our universe, called the Lambda Cold Dark Matter model, 23 percent of the mass of the universe is shaped by invisible particles known as dark matter. As part of this theory, satellite dwarf galaxies orbiting larger galaxies like our Milky Way would form in the surrounding clumps of dark matter in a widely distributed manner, and they should also move in random directions. But in a 2014 study, Marcel Pawlowski of the University of California, Irvine and his colleagues found that dwarf galaxies surrounding the Milky Way and the nearby Andromeda galaxy are orbiting in huge, disk-like structures, much like how the planets in our solar system move in a thin plane around the sun. And now in the current study, Pawlowski and co-author Oliver Müller from the University of Basel found the same disk-like structure of dwarf galaxies surrounding Centaurus A, a massive elliptical galaxy 13 million light-years away. “The significance of this finding is that it calls into question the validity of certain cosmological models and simulations as explanations for the distribution of host and satellite galaxies in the universe,” Pawlowski said in a statement. While other astronomers have suggested that the Milky Way and Andromeda galaxies may have been outliers, this similar behavior in another distant galaxy appears to show that "coherent movement seems to be a universal phenomenon that demands new explanations," Müller said in a statement. However, other studies have suggested that there may be galaxies that are hidden by dark matter, and a 2017 study from the Rochester Institute of Technology showed that the vast structure of satellite galaxies may be unstable and transient, which would bolster the accepted standard model of the universe. This conventional standard model for the origin and evolution of the universe is based on the presence of dark matter, the invisible material thought to make up about 23 percent of the content of the cosmos. This model is backed up by recent observations of the large-scale structure of the universe and other observations of Cosmic Microwave Background that estimate the universe is made of 4 percent regular baryonic matter, 73 percent dark energy, and the remaining is dark matter. But, of course, dark matter has never been detected directly, and the standard model does have its opponents. 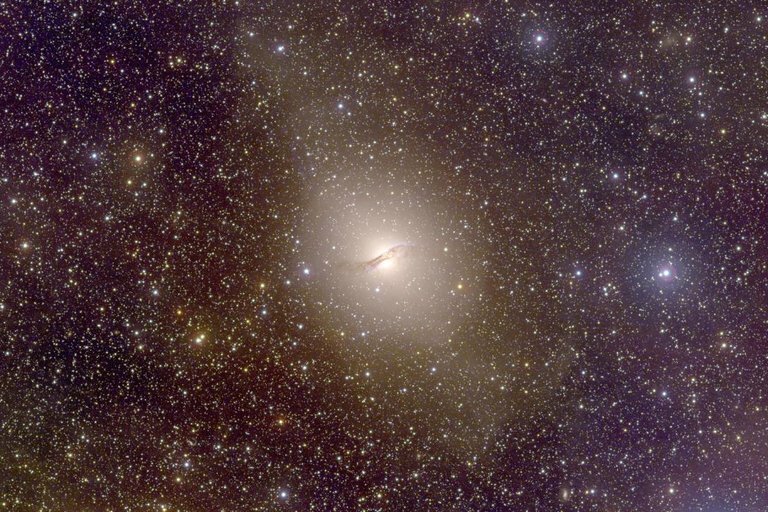 For the current study, Pawlowski, Müller, and their colleagues analyzed the movement of satellite galaxies around Centaurus A. They looked at archival data and found velocity measurements for 16 of its satellites. Pawlowski said the procedure they used is similar to how they analyzed Andromeda’s satellite plane in which 13 of 15 satellites had coherent velocities. The standard model would suggest that only about 0.5 percent of satellite galaxy systems in the nearby universe should exhibit this pattern. Pawlowski is no stranger to the study of dark matter, and has been fairly critical of the standard model. He told Seeker he has perhaps softened in his criticism about dark matter in recent years, but he does remain skeptical. “I think that we, as a field, are a bit overconfident in what the current standard model can accomplish,” he said. “There should be more consideration of alternatives, and we should not jump to conclusions too quickly. In the end, even if the standard, cold dark matter model is correct, we will only really learn about it by challenging it and pushing new tests, always attempting to falsify it.” He added that continued research into Cold Dark Matter is definitely necessary, but at the same time, alternative theories should be considered. Müller concurred. “If we can confirm the predictions, everything is fine, if not, this will certainly lead to a better understanding of our Universe,” he told Seeker in an email. WATCH: What Is Dark Matter's Role in the Formation of Galaxies?